Perhaps the most widely recognized of all dog breeds (because of Lassie), The Collie is a strong, active dog breed that combines speed and strength with grace. The expression on the Collie's refined head shows alertness and intelligence. The Collie originated in Scotland. Male Collies range from 24 inches to 26 inches. Female Collies range from 22 inches to 24 inches. Male Collies range from 60 to 75 pounds. Female Collies range from 50 to 65 pounds. Collies are typically sable and white, tricolored, blue merle, sable merle and white. Collies come in two coat varieties. The Rough coat has a long, straight outercoat with a soft, shedding undercoat, which requires regular brushing. The Smooth coat has a short, flat outercoat with a soft, dense undercoat, which requires minimal brushing. The Collie is susceptible to eye problems, hip dysplasia and epilepsy. The expected life span of the Collie is 8-12 years. Collies do best in homes with fenced yards. This dog breed is not recommended for apartment life since it tends to bark a lot and is inactive indoors. The Collie is in the Herding group. The collie, a dog bred in the United Kingdom to herd sheep, is a beautiful, intelligent dog who makes a great family pet even if you don’t happen to have sheep in your yard. What dogs share the collie’s ancestry? As alluded to above, the Collie breed can be construed to include a bunch of different dogs, in part depending on the part of the world in which you live. A few of the dogs known as collie-type are the Australian Cattle Dog, the Australian Collie (a cross of an Australian Shepherd and a Border Collie), the Australian Kelpie, The Australian Shepherd, the Australian Stumpy Tail Cattle Dog, the Bearded Collie, the Border Collie, the Cumberland Sheepdog, the English Shepherd, the Fam Collie, the German Coolie, the Huntaway, the Lurcher (a cross of the herding Collie with a Greyhound or some other sight hound), the McNab Shepherd, the Old English Sheepdog, the Scotch Collie (which is what we call a Collie in the United States), the Shetland Sheepdog, and the Welsh Sheepdog. Most of these dogs were bred to be working dogs and would not make good family pets. Their high energy level would make them miserable if a family left them alone for any period of time or didn’t give them enough work to do. What does a collie look like? The short answer is that it depends on what type of collie you are talking about. Typically, the name “Collie” refers to the Lassie-type dog in the United States, while in rural Great Britain “Collie” usually means a Border Collie. The Bearded Collie, a totally separate breed, actually looks more like an Old English Sheepdog. For the purposes of this article, we will focus on the Lassie-type dog, which conforms to the AKC breed standard in the United States. What we currently call a Collie is thought to have resulted from the cross-breeding of the early herding collies with the Borzoi (Russian Wolfhound) and / or with the Irish Setter. The Irish Setter likely gave the dog his sable coloring, while the Borzoi was probably responsible for the distinctive, noble head. This dog is perhaps most recognizable by his long face and pointed nose. The ears are erect, but are often trained to fold over to a partly erect shape. A good way to train the ears is to put a wad of bubble gum on the tips of a puppy’s ears to weigh them down. After a few months of this, the ears will naturally fold to the correct position. Collies stand 22 – 26 inches tall at the shoulders and weigh between 45 and 75 pounds, a huge range, partly explained by hair length. Contrary to popular belief, not all Collies have long hair. The AKC actually recognizes two varieties – the smooth coat and the rough coat. 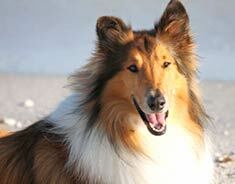 Long-haired Collies are said to have a rough coat, while short-haired collies have what is known as a smooth coat. Queen Victoria herself is said to have single-handedly popularized the short-haired variety. The hair length is the only difference between the two varieties. What colors does the Collie come in? Colors are most frequently sable (ranging from light tan to deep mahogany) and white, tri-color (black, tan, and white), or all white. In some instances, dogs will have an all white body with the traditionally-colored head in either sable or tri-color. Additionally, there may be a blue merle pattern, consisting of mottled areas of blue, black, and grey, with tan markings. The most common coloring is a tan body and face with a white collar, chest, and belly (like Lassie) or a black body with the white collar, chest, and belly and with a tan face (the tri-color variety). Collie puppies who are pale gray, pinkish/gray or beige coloring should never be sold, as they are likely afflicted by “grey Collie syndrome”, more properly known as canine cyclic neutropenia. This genetic disease causes the dog to die young, usually by the age of three years, due to problems with his immune system. Is the Collie hard to groom? A smooth Collie requires virtually no grooming, other than an occasional bath and nail trimming. The rough Collie, on the other hand has a very dense soft undercoat with harsh outer guard hairs in the top coat. Longer hair around the ruff of the neck, the belly, and the backs of the thighs can easily become tangled. The distinctive long-haired ruff of the Collie comes from his working origins. If a wolf or wild dog invaded the sheep’s grazing area, the Collie was trained to run him off. If the intruder attacked the Collie, he was most likely to grab him around the neck, in which case he would only get a mouthful of fur! Brushing is required at least weekly year-round, and daily in the spring and fall during shedding season. This is not the dog for you if you are not a fan of fur on your furniture, carpet, and clothes. Because of the Collie’s heavy fur, some owners are tempted to shave them to make them more comfortable in warm weather. However, this is doing the dog a disservice. The two-layered coat actually traps air close to the dog’s skin and provides a cooling mechanism. It is much better to bring your Collie into the air conditioning, or at least provide a shady location and lots of fresh, cool water outdoors. How does a Collie act? This dog is extremely intelligent and very agile. They have incredible stamina and can run all day with the herd, even over very rough, steep ground. This means they must be challenged both mentally and physically in order to be happy. Obedience training is generally very easy with these dogs as they have no desire so strong as to please their human companions. They are very loyal, but also very friendly, so they don’t make good guard dogs. Their gentleness makes them a great family dog, as they will interact well even with young children. Is the Collie a healthy dog? 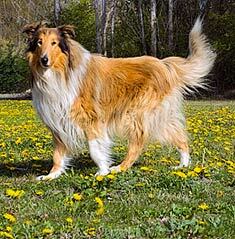 In general, the Collie is very resilient and has few known health problems, living an average of about 10 – 14 years. However, like all larger dogs, there is a risk of hip dysplasia. In this crippling disease, the hips of the dog become dislocated. Because it is a genetic problem, prospective Collie parents should request to see certification from the Orthopedic Foundation for Animals (OFA) on both parents before making a deposit on any puppy. A disease unique only to the Collie is Collie Eye Anomaly (CEA). In this disease, the eye does not properly develop. Severe cases result in blindness. There has been some controversy as to how to eliminate the disease. Some breeders advocate breeding only dogs who have been found to be totally clear of the disease while others state that breeding mildly affected dogs is okay. Until recently, it was tough to definitively diagnose some dogs, particularly those with light-colored eyes. However, a genetic test became available in 2005 which clearly identifies all carriers and affected dogs. In any case, all Collies must be tested for CEA before the age of seven weeks. As dogs age, their eye pigments become darker, making it likely that some dogs will be misdiagnosed as free of the disease when in fact they do suffer from it. Less common, but still of concern, is progressive retinal atrophy, another genetic eye disease. In this case, the retinal tissue degenerates as the dog ages, causing blindness. All breeding stock should be certified as free of inherited eye diseases by a certified veterinary ophthalmologist. If you are considering the purchase of a Collie puppy, ask to see the parents’ CERF (Canine Eye Registration Foundation) certification as proof that both are free of inherited eye diseases. The last thing to be aware of as far as Collie health is that some Collies are born with a mutant gene that causes them to be overly-sensitive to Ivermectin, one of the drugs used to treat heartworm. Care should be taken in prescribing this drug to Collies as even doses that would be appropriate for other dogs of the same size may cause neurological problems or even death in an affected Collie. Is the Collie the right dog for me? If you are looking for a dog who is gentle, intelligent, loyal, and easy to train, the Collie may be perfect for you. However, if you do not want to spend a lot of time grooming a dog or putting up with shed fur, this is definitely NOT a breed you want to have around. Find Collie Puppies with our Free Breeder search!